This semi was involved in a two-vehicle accident Friday morning on State Route 734 at Prairie Road. 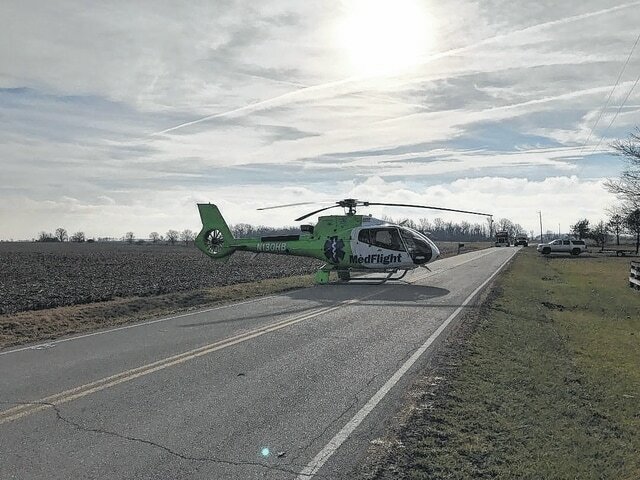 Two individuals were flown by medical helicopter to OSU Wexner Medical Center Friday following a two-vehicle accident. This Hyundai Accent reportedly ran into the side of a semi at the intersection of State Route 734 and Prairie Road Friday morning. Two of the three occupants of the vehicle suffered facial injuries and were flown to OSU Wexner Medical Center. 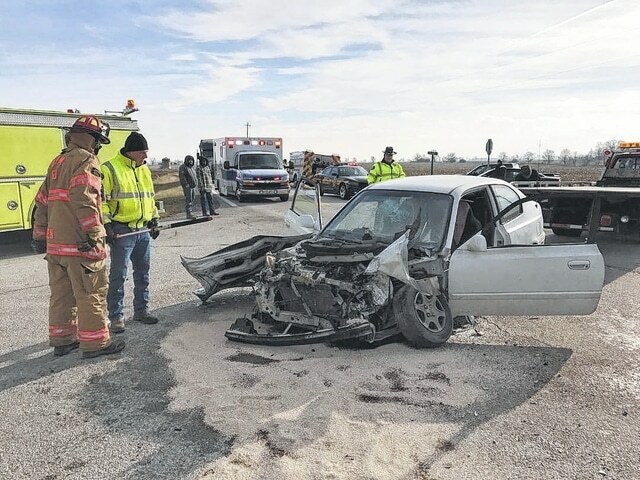 Two individuals were airlifted to The Ohio State University Wexner Medical Center for treatment Friday morning following a two-vehicle accident involving a semi on State Route 734 at Prairie Road. 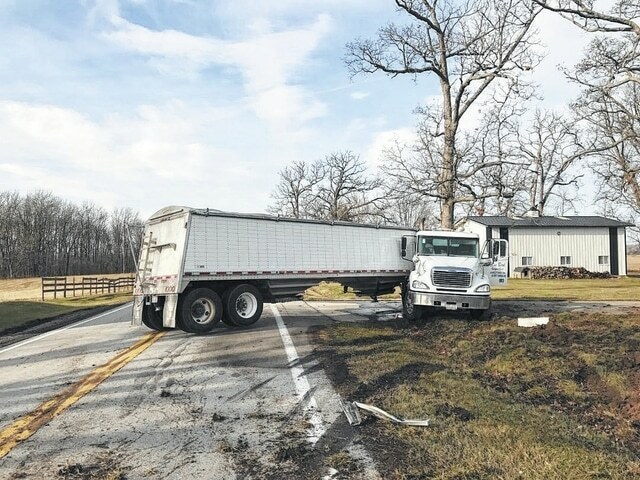 At around 9:30 a.m., a Freightliner semi-truck hauling grain was heading westbound on 734 while a white 2005 Hyundai Accent was heading southbound on Prairie Road, according to the Fayette County Sheriff’s Office. The Accent, driven by Samanthakay Bainter, 25, of Jeffersonville, reportedly failed to yield and struck the side of the semi. The force of the accident caved in the front of the Hyundai Accent. Bainter and the front seat passenger, Tyler Jones, 28, of Columbus, reportedly suffered facial injuries from hitting the windshield dashboard. They were both flown to Columbus for treatment of their injuries. An individual in the backseat of the Accent, Raymond Wallace, 31, of Jeffersonville, was checked by Fayette County Life Squad personnel, but did not have to go to the hospital for treatment. The driver of the semi-truck, Brent Guess, 36, of Jamestown, also suffered no injuries during the crash. https://www.recordherald.com/wp-content/uploads/sites/27/2017/01/web1_Semi.jpgThis semi was involved in a two-vehicle accident Friday morning on State Route 734 at Prairie Road. https://www.recordherald.com/wp-content/uploads/sites/27/2017/01/web1_Helicopter.jpgTwo individuals were flown by medical helicopter to OSU Wexner Medical Center Friday following a two-vehicle accident. https://www.recordherald.com/wp-content/uploads/sites/27/2017/01/web1_Scene.jpgThis Hyundai Accent reportedly ran into the side of a semi at the intersection of State Route 734 and Prairie Road Friday morning. Two of the three occupants of the vehicle suffered facial injuries and were flown to OSU Wexner Medical Center.